VACPA will join hands in managing and supervising the quality of auditors' professional practices an ethics. It will also serve as an advisory agency to the Government in making policies on accounting and auditing regimes. Organizing and administering registrants for CPA exams. Chairman of VACPA is Mr. Bui Van Mai, who is the head of the Accounting and Auditing Department of the Ministry of Finance. Vice chairpersons also include a vice directors of a large local audit firm and a local partner from Ernst & Young. Members of VACPA are people with CPA certificates granted by the Ministry of Finance and working in practice in accounting and auditing companies in Vietnam. It has now an membership of about 615 practicing auditors from 78 accounting and auditing companies in Vietnam. The Decree 105 sets out the conditions which must be satisfied in order to be recognized as a fully qualified auditor in Vietnam. Auditors must possess university level education in the fields of economics, finance, banking or accounting (auditing) and must have done financial or accounting work for a period of at least five years or have worked in auditing firms as assistants to auditors for at least four years. CPA exams are organized once every year in Hanoi and Ho Chi Minh city. There are eight subjects, namely Economics Law, Finance, Money and Credit, Informative (theory and practical tests), Accounting, Auditing, Foreign Language (writing and speaking tests) and Economics Analysis. To sit the exams, CPA students must attend a short training course organized by the MoF in 2 months prior to the official exams. As there is no official training function and activities in VAA, lecturers are outsourced on an ad hoc basis from various universities and entities. Most of lecturers are sought from the University of Finance and Accounting. It is noteworthy that in order to become a fully qualified auditor, a person must have the ability to command a common foreign language and use computers fluently. In practice, if an auditor performs auditing services for foreign invested enterprises, it would be necessary for the auditor to be able to communicate in English. However, this condition seems to unfairly prejudice Vietnamese auditors who choose to only perform auditing services to Vietnamese companies and State owned enterprises. 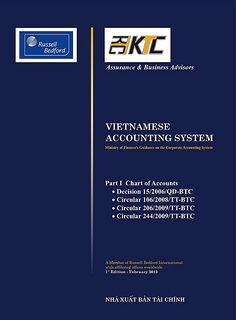 With respect to persons having certificates in accounting or auditing granted by foreign countries which are recognized by the Ministry of Finance and wish to carry out auditing services in Vietnam, they are required to pass exams in the economic, finance, accounting and auditing laws of Vietnam and be granted certificates by the Ministry of Finance. The most common foreign certificate in accountancy in Vietnam is ACCA (Association of Chartered Certified Accountant, UK). Up to December 2004, there was 106 Vietnamese granted ACCA certificates, of whom, 60 people are working for auditing firms. Currently, auditors with ACCA certificates must pass an exam in a multiple question form to have CPA Vietnam. Many ACCA students elect to sit this multiple question exam to have CPA as it is perceived as “easier” than conventional 8 subject CPA exams. In 2004, the MoF agreed with ACCA to accredit the ACCA programs with CPA Vietnam. Taxation and Business Law will be customized. If a person pass 4 ACCA subjects including the two customized taxation and business law one, he or she will have two certificates, being ACCA and VNCPA. However, it is unlikely that a person passing VN CPA can automatically have ACCA certificate. Big Four in Vietnam have official policy for their employees to obtain ACCA certificates in Vietnam. Having international certificates in accountancy like ACCA in Big Four is an rewarding objectives of most staff members. Following ACCA successful story, CPA Australia is trying to jump into the emerging Vietnam's auditing market. CPA Australia have met with the MoF, VAA, universities and selected audit firms in Hanoi and Ho Chi Minh early this year. It is expected that CPA Australia will provide regular training courses, grant professional certificates and seek a conversion program into VN CPA like ACCA. Decree 105 also stipulates the list of persons banned from practicing as independent auditors.